Hypnosis has been used for therapeutic purposes since the 1770’s, but the concept of inducing an altered state of consciousness to produce healing spans thousands of years and virtually every culture. Dr. Kweethai brings a fresh perspective to this ancient art. Too many practitioners focus on eliminating issues of concern to their clients. Dr. Kweethai’s process, in contrast, facilitates change toward improved health and greater happiness. Learn more about Hypnotherapy at this interactive workshop March 4 & 5, 2017, in Hong Kong with Dr. Kweethai. This is a 2-day workshop, 9 am - 6 pm both days, open to the public. People who are chronically stuck, sick, or just plain unhappy, are responding to negative emotions that have taken up residence in the subconscious mind and resist every attempt to uproot them. Medical science addresses the physical body. Talk therapy and self-help operate at the level of the conscious mind. To get at the negative emotions in the subconscious mind requires an altered state of consciousness. That is the brilliance of hypnotherapy. A skilled hypnotherapist opens the subconscious so that emotions can be revised, thereby transmuting emotions that have supported unwanted behaviors and habits of mind and body. As fear and anger are transmuted to love and joy, one feels a renewed sense of self, a Self worthy of love and respect. Complementary therapy accompanies conventional medical treatment. It is recommended practice for hypnotherapists to require that clients first see a physician to rule out physiological or biological causes of suffering. If such a cause exists, hypnotherapy can serve as a complementary therapy to reduce fear, anxiety and pain. If conventional medical treatment has provided no relief, hypnotherapy is often an effective alternative. In fact, for most clients, hypnotherapy is sought as a last resort; as an alternative to other things that have not been effective in producing the change they want and need. Practice self-hypnosis for relaxation and focus. Hypnosis is mostly relaxation and focus. For people who work in fragmented, frenetic, stressful circumstances that would be enough. With more extensive training and certification, you can then use hypnotherapy to help with issues as diverse as pain management, weight control, study skills, sport performance, anxiety and phobias. Hypnosis is used in medical and dental settings related to surgery and recovery, and is very common in preparing for childbirth. Develop an awareness of how language influences health and happiness. Hypnotherapy relies heavily on language choice. You become not only what you say but what you think. You will learn how to revise negative expressions and actions into positive alternatives. Motivational reminders on the bathroom mirror, computer screen and coffee cup serve no purpose unless you have a purpose. An intention defines what you want to become, how you want to feel, where you experience your life’s direction, who you want to be with or work with. Intentions follow specific rules. If you follow the rules, motivation helps move you in the direction of your intentions. Break the rules and motivation reminders become souvenirs of a disappointed life. Far too many people base their intentions on assumptions about what they should be doing with their life. Hypnotherapy clarifies what you need to be happy, then learning to value yourself enough that your happiness takes priority over all other assumptions. That does not mean you must ignore the needs of others. But, the greatest source of life dis-satisfaction is when you consider yourself unworthy of happiness and therefore assume your own needs to be of low priority. You can best increase the happiness of others when you are happy yourself. The subconscious mind stores fears from childhood that impel unhealthy behaviors as an adult. Consider, it is not what you eat, but what is eating you, when good intentions and will power fail you. If you experience uncontrollable anger or too often feel like a scared child, it is because emotions, not logic, govern your life. And that impedes health and happiness. Hypnotherapy is a fast and effective way to resolve negative emotions and allow you to move forward with your life. Clients enjoy pleasant hypnotic relaxation while being helped to transmute anger, fear and suffering into love, excitement and joy. Hypnosis is not magic, but it is magical. Dr. Kweethai will explain how hypnotherapy works to change minds and lives. The result is improved health, greater happiness and increased confidence in a snap of time. Only when you understand how the subconscious mind influences choices and governs behavior can you make positive changes in your life. All hypnosis is self-hypnosis. You CAN change your Mind. To learn more about hypnotherapy, order Dr. Kweethai's book. Written for a lay audience, this book has been quite effective at alleviating concerns among potential clients with no prior knowledge of hypnotherapy. * Dr. Kweethai will be traveling with only a limited number of copies, so order now to make sure you get one. Books ordered now will be delivered with other workshop materials on the day of the event. Maybe you identify with aspects of hypnotherapy described above. Maybe you see how family, friends, or other acquaintances might benefit. Or maybe you are simply intrigued by how the subconscious and conscious mind interact to influence behavior, habits or reactions. Dr. Kweethai is a master hypnotherapy instructor. In addition to having taught hundreds of hours of basic and advanced training, she speaks annually at national and international hypnotherapy conferences. She is a regular contributor to the IMDHA journal Unlimited Human. 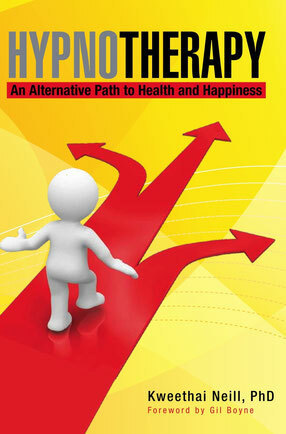 This workshop is derived from her book, Hypnotherapy, An Alternative Path to Health and Happiness. Advanced Hypnotherapy skills for relief of pain and trauma.